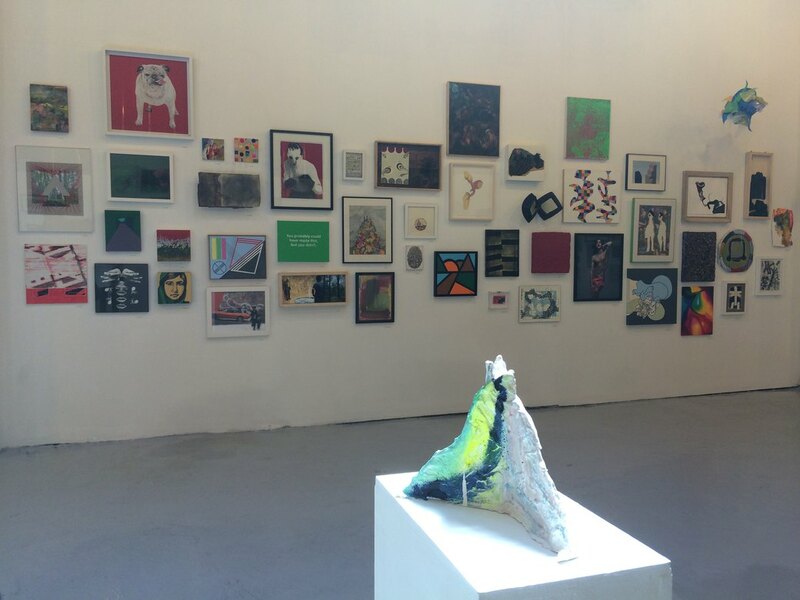 400 artists; six walls; two rooms filled with their small works. Storefront Ten Eyck gallery in East Williamsburg. All of the works are available to be collected and with a little bit of luck in the raffle, you can go home with a piece worth several times more than $200 ticket! Loren Munk, Dan Zeller, Lisa Corinne Davis, Ward Shelley, Meryl Meisler, William Powhida, Rich Timperio, Rob de Oude, Lisa Levy, Meg Hitchcock, Enrico Gomez, and Deborah Brown are just some of the distinguished artists who donated their work to the Arts in Bushwick (AiB) Benefit Exhibition Making History. Historically, a one-night affair preceding Bushwick Open Studios (BOS), has expanded into a three-week, all-inclusive, open-call exhibition, Making History, and it provides a survey of the current Bushwick art scene, celebrating one of the most concentrated and diverse artist communities worldwide. Work in the exhibition includes painting, sculpture, drawing, and photography, yet the unifying theme is the idea of Bushwick. In this sense, Bushwick is not a physical location defined by the boundaries of Broadway, Flushing, or the Eastern Parkway Extension, but a place where (at least in the past decade) artists were able to find cheap rents that afforded them creative space. In the 70's, it was called SoHo and in the 90's, it was Williamsburg. But today, we have Bushwick. "It's like walking through a history book," told us Burr Dodd, artist and owner of Brooklyn Fire Proof. "Making History is the manifestation of this little pocket in history, of those who “partake in the reception, exchange, and generation of the energy which is manifest as art,” as Loren Munk wrote in his 2006 essay History by Exclusion, Illuminating the “Dark Matter” of the Art World that inspired that exhibition’s title. 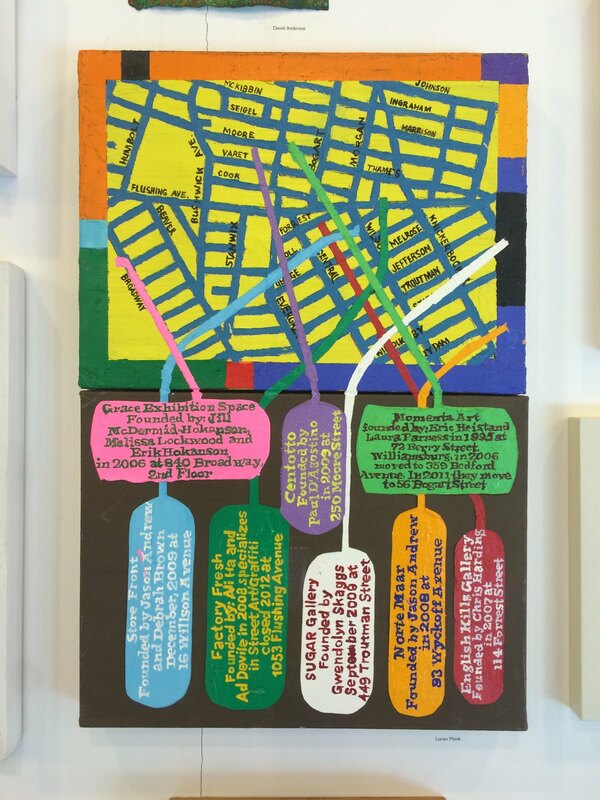 A longtime Bushwick art scene aficionado, Munk has also donated one of his original map paintings, marking some of the spaces that were on the grid in 2009, including Grace Exhibition Space, Momenta Art, Centotto, Storefront, Norte Maar, and English Kills Gallery. Making History concludes on May 10 with a raffle of artworks. The event will be emceed by Lisa Levy (you know her from Dr. Lisa's advice column) and Ben Boothby. Now, here's some great news. The tickets are still available for $200 at the gallery or online through the AiB website. 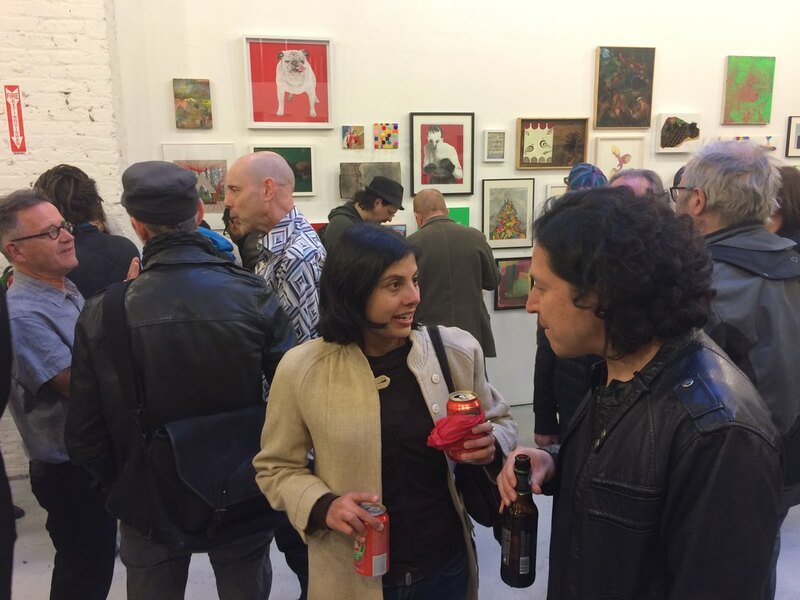 The proceeds from the benefit will fund AiB’s year-round community projects in addition to the costs of creating the three-day Bushwick Open Studios. The event on May 10 will also honor Express Yourself Barista Bar, Still Waters in a Storm, and EcoStation:NY in recognition of AiB’s Community Projects partners. How will the raffle work? As ticket numbers get called at random, the ticket holder with the corresponding ticket picks her chosen piece of artwork and goes home with it that night. So with each raffle ticket guaranteeing an artwork, the real excitement comes down to the luck of the draw. Who will get first choice and what will he chose? What drives the collector? Is it getting a big-name piece that could be worth $1,000 for a bargain of $200 or is it taking a gamble on an unknown artist for the love of the work? If your ticket gets pulled last, will your first choice still be there and, if not, what world will that unexpected artwork open for you? A tactical strategy may be bad-mouthing your favorite piece in hopes that it won't appeal to your ticket-holding competitors. Or just hope that the low-hanging favorite will slip by unnoticed by the first 100 as you wait for your chance to snag it. While there are several strategies and various motivations, an early viewing and an extensive list of selections is definitely the best way to prepare. 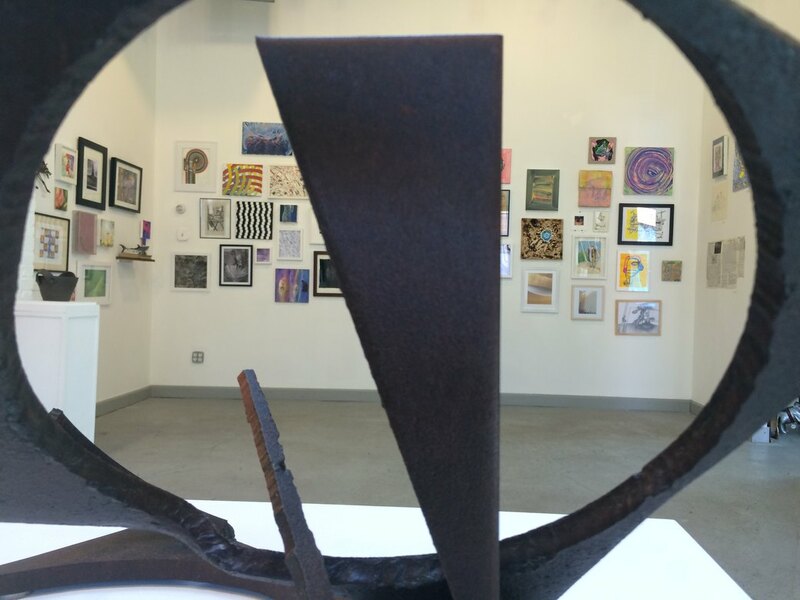 “Making History,” April 19-May 10, 2015, Storefront Ten Eyck, 324 Ten Eyck St, E. Williamsburg. Tickets are available online or in the Storefront Ten Eyck gallery.